What better way to take in New England’s fall foliage than a historic train ride? There’s no danger of running off the road while taking in the beauty wrought by Mother Nature’s paintbrush. New England has more than two dozen so-called heritage railways, museums on wheels that recreate the experience of train travel during the golden age of passenger rail. Sometimes heritage railways are run as profitable tourist attractions, but more often they’re maintained by enthusiastic volunteers. Rail enthusiast restore and maintain vintage steam and diesel locomotives, passenger coaches, track, stations and other infrastructure. Here then are six heritage railroads that offer passengers a historic train ride, one in each New England state. If you have other favorites, please include them in the comments section. Back in the day, travelers often journeyed by train to a steamboat landing, then continued on their way by water. Alas, only one steam-train-and-steamboat trip remains in the United States: in Essex, Conn. The Essex Steam Train & Riverboat ride Is also only one of two in the world. 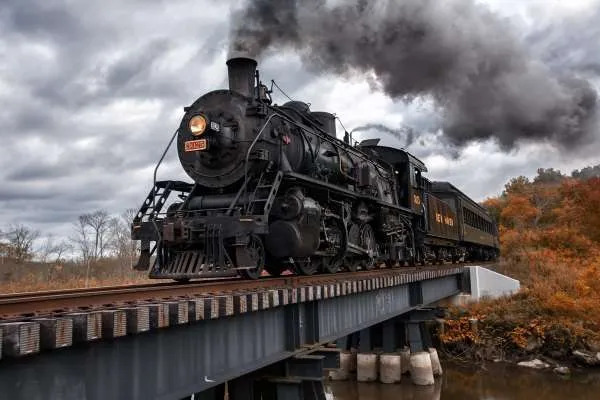 It’s part of the Valley Railroad, which formed a century after the Connecticut Valley Railroad started regular train service in 1871. For a while it operated as a branch line of the New Haven Railroad. By 1961 the New Haven Line declared bankruptcy and all service finally stopped in 1968. The New Haven Railroad became the Penn Central (later Amtrak), and Penn Central gave the Valley track to the state of Connecticut, which leased it to a group of volunteers. The Essex Steam Train & Riverboat ride runs from May through October. The 2-1/2-hour historic train ride begins at the Essex Station, built in 1892. It then runs for a 12-mile round trip through the quintessential New England towns and unspoiled parts of the Connecticut River Valley. Passengers aboard the 1920s-era coaches will see Selden Neck State Park, Deep River and Chester. Check the calendar here for dates. Antique rail cars take passengers on a 90-minute trip through 13 miles of wetlands and woods, where passengers may see fox, bald eagles, bear, osprey and moose. Many of the same sights the rusticators saw when they took the train to their summer cottages in Bar Harbor. 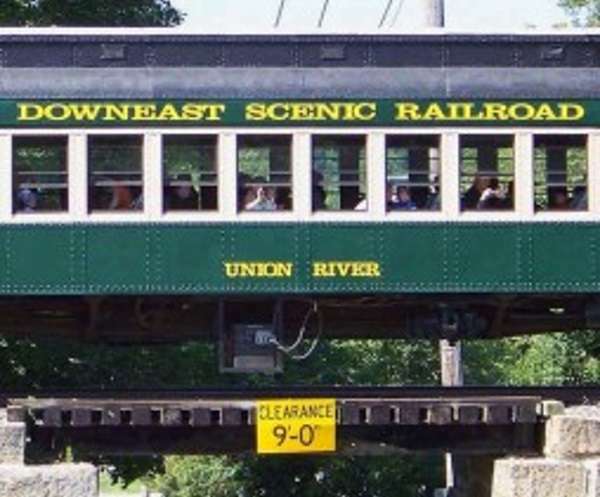 The Downeast Scenic Railroad started as the Calais Branch line, built in 1884 as the Maine Shore Line Railroad. Later the Maine Central Railroad Co. bought the line, but closed in 1985. It stayed closed for 30 years. Then five local businessmen formed the Downeast Rail Heritage Trust in 2005. The next year they leased 30 miles of track from the state of Maine. Volunteers restored the rails, an engine, passenger cars and caboose. Service restarted on July 24, 2010, when invited guests took a historic train ride along five miles of track from Ellsworth. 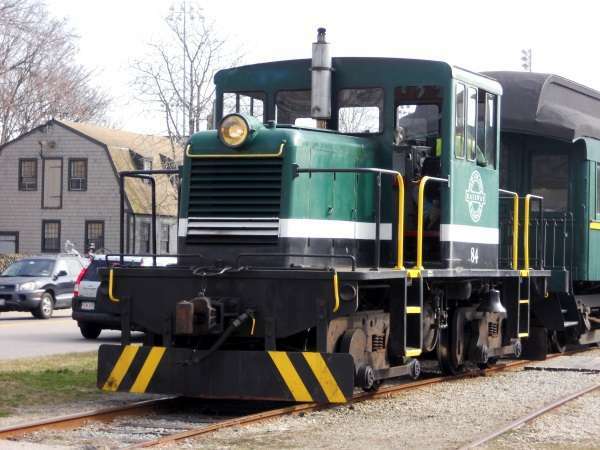 The Cape Cod Central Railroad offers a historic train ride along 27 miles of track from Hyannis to Buzzards Bay. It’s a remnant of the first train on the Cape, built in the mid-19th-century to carry freight to and from the Boston and Sandwich Glass Co. Eventually the railroad carried passengers between 14 of Cape Cod’s 15 towns. Then in 1935, the Buzzards Bay vertical train lift extended the railroad across the Cape Cod Canal. Passenger service on Cape Cod stopped in 1959, but 40 years later the Cape Cod Central Railroad formed. In 2012, Iowa Pacific Holdings LLC bought a controlling interest in the company. The Shoreland Excursion takes passengers on a two-hour historic train ride past salt marshes, sand dunes and cranberry bogs, then along the canal. They’ll also see historic railroad buildings, including the West Barnstable station and the Buzzards Bay dispatch tower, both built in 1911. In Bourne, the Gray Gables Station, built in 1892 for Grover Cleveland's personal use, now serves as a rail museum. The railroad, which runs from May to October, also offers brunch trains, dinner trains and special excursions. For a schedule click here. See a short video about the Cape Cod Central Railroad here. A train set from the Winnipesaukee Scenic Railroad. Photo courtesy Google maps. The Winnipesaukee Scenic Railroad offers a one- and a two-hour historic train ride in restored coaches along the western shore of New Hampshire’s biggest lake. Passengers can board at the station in Meredith, or at the Weirs Beach Station on the historic boardwalk. During the historic train ride they never lose sight of Lake Winnipesaukee. The railroad once belonged to the Boston & Maine Railroad and brought tourists to lakeside resorts from the Gilded Age to the 1950s. Today, the Winnipesaukee Scenic Railroad still goes through the front yards of gracious old summer homes. Passengers can also take a 40-mile Fall Foliage Special. Call 603-745-2135 for information. A locomotive during the Old Colony and Newport Railroad days. 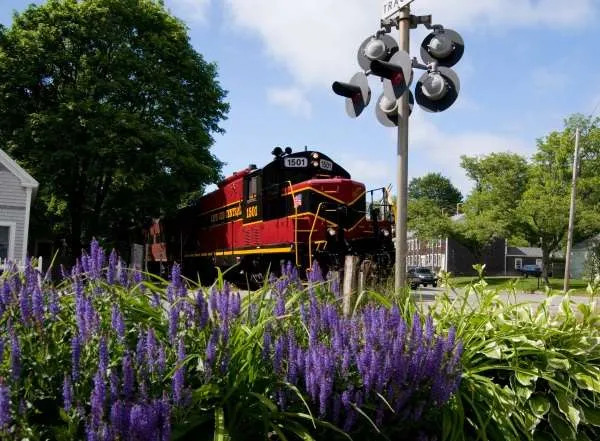 The Newport and Narragansett Bay Railroad runs historic train rides on Aquidneck Island, offering gorgeous views of the bay, colonial homes and the decommissioned USS Saratoga in the Newport Naval Station. The railroad once belonged to the Old Colony Railroad, a major system running from Boston to southeastern Massachusetts, Rhode Island, Lowell and Cape Cod. In 1976, then-owner Conrail sold the railroad to the state, which then leased it to the volunteers who ran the Old Colony and Newport Scenic Railway. The new railway formed in 2014 when the for-profit Newport Dinner Train and the nonprofit Old Colony and Newport Scenic Railway merged. It runs between the Melville Marina section of Portsmouth and downtown Newport. Today, Rhode Island’s only heritage railroad also offers dining experiences, as it has a kitchen car and chef. The Grand Bellevue Rail Dining Experience, for example, offers a two-hour, multiple course, formal dinner with live music. Other themed excursions include such excursions as the Autumn Harvest Bistro train, Lunch with Santa and Murder on the Bellevue Express. 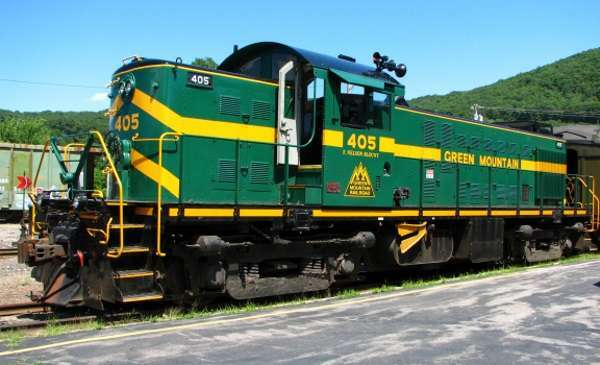 Green Mountain Flyer locomotive 405. During five weeks of New England’s glorious foliage season, the Green Mountain Flyer runs five days a week from Chester, Vt. Passengers can take a historic train ride on a Fall Foliage Excursion, a Cocktails on the Rails trip or a Green Mountain Dinner in a restored dining car. The Green Mountain Railroad, one of New England’s oldest heritage railroads, formed in early 1964 by a steam-locomotive enthusiast. F. Nelson Blount persuaded the State of Vermont to obtain 52 miles of track between Bellows Falls and Rutland. Blount also ran a museum of steam locomotives, called Steamtown, USA, in North Walpole, N.H.
Blount died in an airplane crash in 1967 but his dream lived on. Today, the Green Mountain Railroad is part of the 350-mile Vermont Rail System. The Green Mountain Flyer, named after the fastest train on the Rutland Railroad, runs for 13 miles between Bellows Falls and Chester along woods, the Williams River and the Brockway Mills Gorge. In the fall, a foliage excursion takes passengers another 14 miles to Ludlow. For a schedule, click here. Images: Valley locomotive By Msomerville21 - Own work, CC BY-SA 4.0, https://commons.wikimedia.org/w/index.php?curid=44814393; Cape Cod Central Railroad By Mark from Baltimore, USA - .Uploaded by XV HTV 1352, CC BY 2.0, https://commons.wikimedia.org/w/index.php?curid=7379781; Old Colony and Newport locomotive By Toby7OCN - Own work, CC BY-SA 3.0, https://commons.wikimedia.org/w/index.php?curid=19193774; Green Mountain Railroad locomotive By NellsWiki - Own work, CC BY-SA 3.0, https://commons.wikimedia.org/w/index.php?curid=9510777.